This page has posts about projects that do NOT include glove knitting – mending, crochet, other knitting and so on …. This is one of a pair of gloves that my partner wears for walking. They came from a small sports shop round the corner and were not expensive. 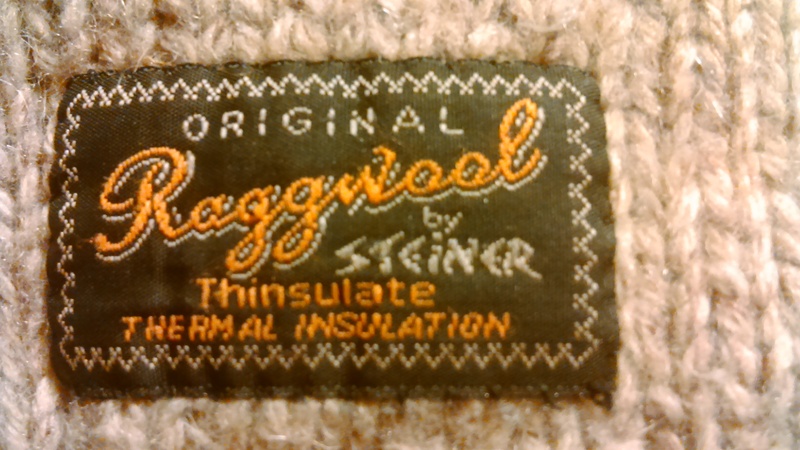 But they are fleece lined and knitted from tough yarn the Americans call Ragg. Anyway, a finger had worn through and as we’re going for a big walk on Saturday it had to be mended. I explained the concept of visible mending to my partner and he said to go for it. So here it is. I was taught plain sewing at school and hated every minute and I’m not so keen now. However it is good to see something that will carry on being useful, and warm, for the sake of 10 minutes work. I’m not sure who coined the phrase, ‘visible mending’ but I know it best through the work that Tom of Holland has done and written about on his blog, here. So thank you to Tom and other menders, visible and non-visible. Also, look up the wonderful work he did when the Knitting & Crochet Guild commissioned him to work on a wonderful cardigan from Fair Isle: now even more wonderful. I went on holiday last week, to Wales where we have a static caravan overlooking St David’s Head. So of course, ignoring the fact that I was looking after two boys, going walking and so on, I took with me lots of knitting. A hat that I started on the machine and finished by hand. I needed this as I have been out up mountains in strong winds lately and found that my hat has been blown over my eyes and not helped by a flapping hood, so I thought I needed a tight fairly short beanie type hat. I found some stash yarn which I think might be wool and mohair, artisan dyed, from Brooklyn General, New York, some years ago. Anyway, here it is, as planned. Think it will do the trick. Just to explain a bit, the rib section is made on the machine – took about 30 mins including getting sorted out, then I took it off onto waste yarn. Picked the stitches up on a couple of circulars, I think 3.25mm, and started the crown shaping almost immediately. This was every 14sts, every 3 rounds and then alternate rounds, and then every round. Gloves: A new pair of gloves, in the series for my Welsh friends. I knew I wanted to use neutrals, and eventually settled on this rather pinky beige with a dark slatey grey. Neutrals sound easy but I found choosing these especially hard. eventually I chose them for thickness as much as colour, the grey being slightly thinner than the pinky-beige, which means that it will recede when knitted. That will echo the striations in some rocks on a beach on Anglesey which was one of the inspirational images. The I’ve got both hands cast on and am starting with a one and one rib. 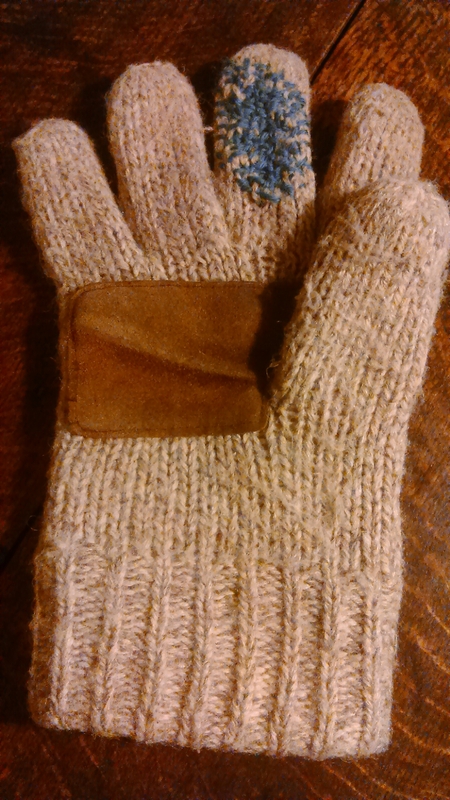 Bonham’s mittens: I also took the Bonham’s mittens which I thought I’d finish. Indeed I did finish the hands, but thought I had brought enough of the turquoise wool, forgetting that I had to knit the thumbs, after completing the hands. So here they are with one having the thumb knitted. These will be translated into a Knitting & Crochet Guild pattern on Ravelry as soon as I can write the instructions. You might realised that the pattern on the Bonham mitts and the gloves is the same – that is a small chequerboard, 2sts x 2 rows of each colour. And the last project, which I had hoped to spend some time on, is some stash yarn, a discontinued Colinette merino tape, in an inky blue-black and the pattern for a tunic style sweater which my mother knitted for me from her very first hand spun yarn. I wear this for walking most of the year and I thought that I remembered that the pattern came from Paton’s Fashion Knits in the 70s. My mother knitted a lot from this series, so I asked the pattern guru at the KEG collection to see if she could find it. Sure enough, there was a copy in the collection, from 1976 when it was on the cover. The suggested tension for the garment and for the Colinette yarn (tagliatelle) are very similar and I think just a little swatching should sort out some ideas for making the garment in the yarn I’ve got. However, what with boat trips, new caravans to sort out, friends visiting and other distractions, I didn’t get anywhere near this project at all. Another time. I really don’t need another jumper in fact. 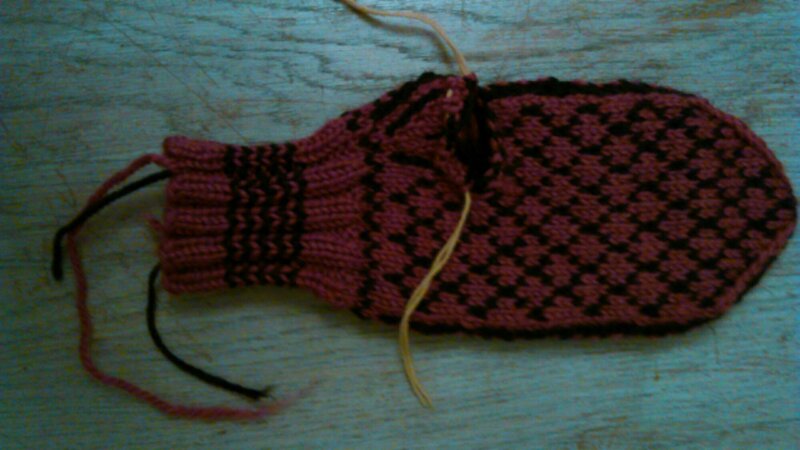 Well, I have been busy in the glove department – I have been designing and knitting a pair of gloves, and writing a knitting pattern, and also an article, but all this is for publication so I can’t blog about it, unfortunately. There was a demo in Central London today against the cuts in public spending being made. The organiser of Woolagainst weapons organised with Lush, a shop on Regent Street, to knit there. 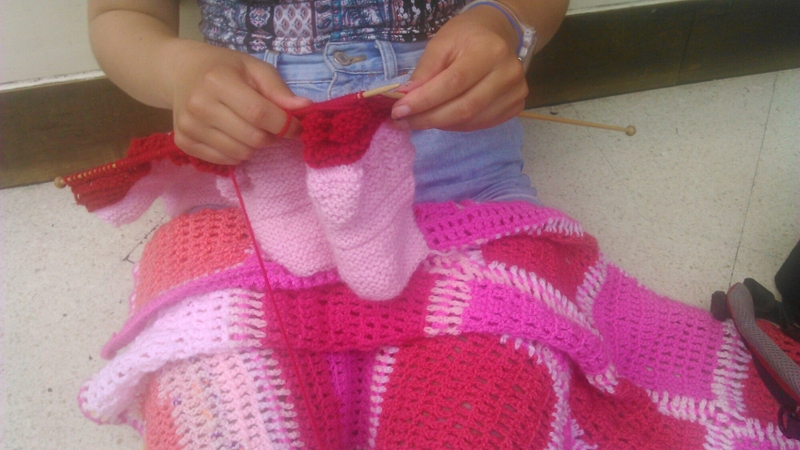 The people knitting and crocheting are members of a Woodcraft Folk group in Stroud. It was a lovely interlude, great people, hot sun and lots of interest from those buying soap and bubble bath in Lush. My current obsession is this crochet blanket. I found some notes and pictures from when I was planning it dated 2001. I decided to do the 10 minute a day method of shifting stuck projects and now I’ doing 30 mins a day and listening to Spanish with Michel Thomas. Glove knitting is too complicated for that. Number Knitting: suitable for travelling? I need some straightforward knitting for the trip to California – we go next Thursday and gloves are good because they are small but bad ‘cos they’re complicated. I’ve had a skein of hand dyed Botany wool for over a year now and it’s the right colours to go with my storm jacket so I’m making a scarf. Number Knitting is a book that I’ve had for years and I’ve tried some things from it but it really does deserve to be explored more fully. There was an article about it in Piecework (I think) last year. It’s by Virginia Woods Bellamy and was written in the 1950s. This is the sample piece so far. It’s based on 30 sts but I think I’ll up it to 60 for the real thing. Well another dig around produced another little crop of projects. Here they are. Some are destined for the bin, sadly, like the single bootee as I know I’ve no more of that yarn. Others might get revived, like the red bootees. The wherewithal to knit a pair of Duke pattern, or variation of it, gloves. I’ve only done one pair based on the damrod and would like to have a go at another. Work in progress. Well I’m wondering what to do next – I have several gloves in the planning stage – but would also like to make myself a cardigan on the machine and perhaps a simple quilt on the sewing machine. I got out all the bags with almost finished objects, just started objects, been in progress for many years things and found 11 in total which actually I think is not bad. Some are just the yarn put in a bag ready to go and some need a couple of hours work to complete. There’s a 12th but that’s downstairs; it’s a single bed size crochet blanket that’s starting to give up the ghost in a very random way, only one of the yarns almost completely disintegrating. That will need some brain power to sort out and therefore time. My Guild of spinners, weavers and dyers, the On line guild, starts the year with a UFO (unfinished object ) project in which people do what I’ve just done and then make a start on clearing the decks. It’s really popular and people dig out al sorts of things that have been on the go years – think blankets for babies who have just gone to college and you’ve got the scale. However, I didn’t have time to take part in that and I may decide that I don’t have time to do anything about this lot either just now. 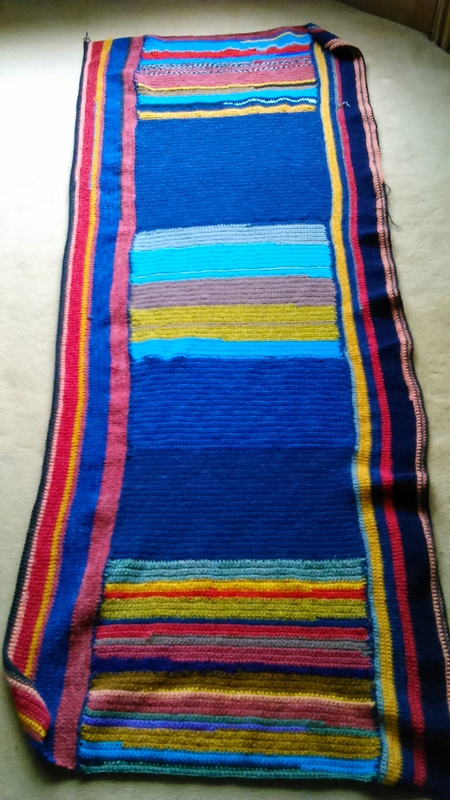 A blanket from mitred squares from Virginia Woods Bellamy’s book Number Knitting (see article in Piecework last year). A baby hat from an Elizabeth Zimmerman newsletter. Just needs the icord grafted and some ties. Hate the colour. Must have been trying something out. I finished the hat in time to go on quite a long walk in the Dales. Here it is on a rock. I took a picture of the crown shaping as I think it looks so good. It’s ages since I knitted a hat by hand and this one is lovely. (Actually I unpicked and re-knit the crown and shaping since this picture as I had a few yards of navy wool left over so I unpicked, knitted the few extra rounds and re-did the crown. I was then short of yarn and had to complete the last 2 – 3 rounds with a very close match. It was some 5 ply guernsey wool used double and is an almost perfect match). End of story. I need a hat for walking. There are several in the house but not one knitted by me. There was some wool left from the Selbuvotter mitts but more navy than pink. This is the start of it with a deep rib that will turn back. The mittens are finished, ready for me to go to Norway tonight in hope of seeing the Northern Lights. I’m so excited I can’t sleep. 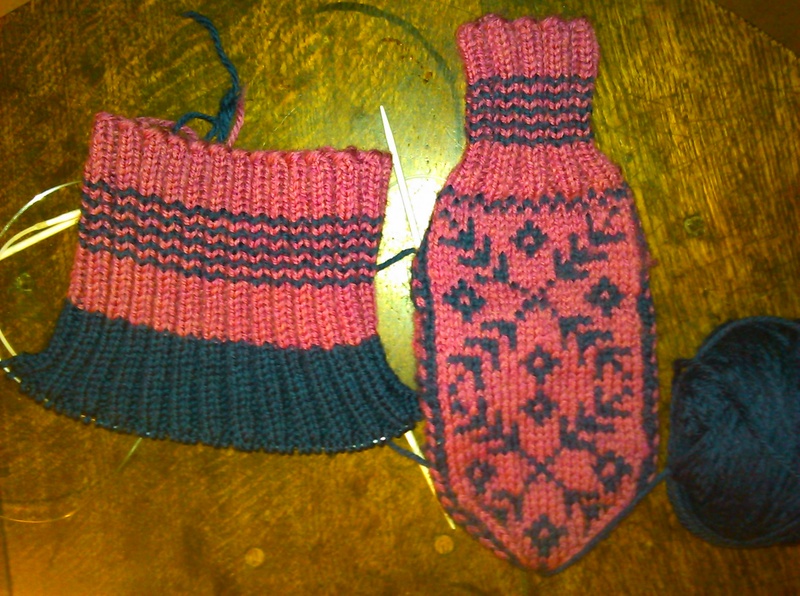 Here are the mitts, not quite finished, but they are now. I’m so pleased with them and I might just have enough for a hat if I use the navy as the main and the fuchsia as the contrast. I’ll upload a pics of them really finished in the morning. I wanted to knit from an existing pattern as I have been writing one for gloves and puzzling over how to do the thumb placement and chart. I have a couple of balls of Brown Sheep Lambs Pride Superwash that I’ve been dying to have a go with so I cast on for a Selbuvotter pattern. 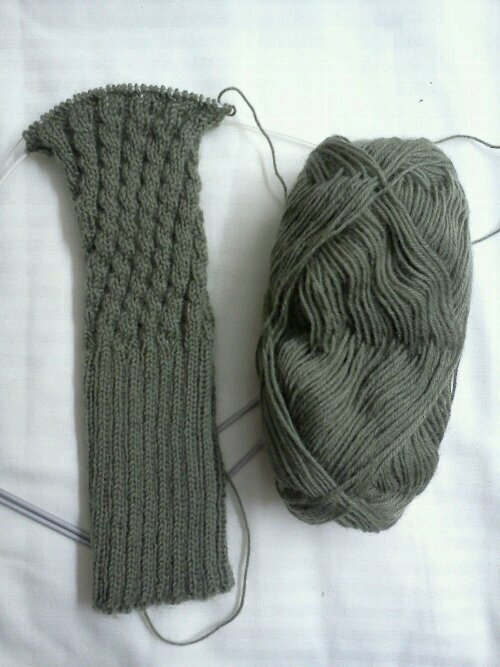 Worked on two circular needles as usual. This is the first one without its thumb. It just needs its thumb. Has taken about two days so much quicker than 3 ply! And I decided to experiment with magic loop – using just one circular needle as one of the ones I was using is VERY long – probably 100 cm. So I have tried it, but as I thought, it pulls out the stitches where it is pulled through. It would be ok at a pinch if you only had the one circular. I’m back on two now. I’m on hols. I’m knitting socks. These are spiral no heel ones from the Second World War, a pattern from the KCG collection. I’m looking forward to seeing what they are like to wear, especially with walking boots as I have only seen them as bed socks until now. I’m knitting them from yarn supplied by Baa Ram Ewe the wool shop that promotes British and especially Yorkshire wool and yarns. They will go in a display of items about the Second World War in the window of the Harrogate shop. One sock is now complete and one is going in on its needles. The Knitting and Crochet Guild is supplying the things from its collection and two of us are doing a talk and demonstration on 16th October – 6 – 8 pm in Harrogate. Over Easter I’ve been catching up on unfinished projects. So I put together some swatches to make a small knee rug lined with fabric I brought back from a trip to Nepal in the mid 1990s. The swatches are almost the last from my MA in Knitwear Design, well over 20 years ago so they are a real mixture, all the ones that really go together having been made up a long while ago. And a close up: the fabrics are all pure wool, many hand dyed by me and are all machine knitted. The other project I’ve finished is a sewn tapestry, most of which was not done by me. Still the edges needed doing and now it’s ready to be blocked. Of course, this is nothing to do with design! I decided that the sort of glove you buy in outdoor shops for poor weather are not very effective, when wet they become hard to get on and off and they are not especially warm. I read about fisherman’s wet mittens in the Robin Hansen book, Fox and Geese and Fences. These are reputedly felted in hot salt water and are warm even when soaking wet. So now I really need someone to try them out in poor weather. I think the opportunity will come either this weekend or straight after Xmas. I’m going to add either loops to hand them up by or a longer wrist loop or elastic, I haven’t decided which yet. To felt, I started by hand which took ages – about 30 mins of solid rubbing with soap and washing up liquid, then the others I have done in the washing machine. I asked my On line Guild of Weavers Spinners and Dyers for some tips and got several which was brilliant, including this link to a free pattern for felted mitts with some great tips for the actual felting at Drops. I do knit things that aren’t gloves mostly to have something that I can do that doesn’t require total concentration or something that can be knitted on the machine. I am very reluctant to knit by hand if it can be done on the machine – therefore flat stocking stitch is a no-no, while garter stitch is a hand knit favourite. I have been busy with the knitting machine making socks as birthday presents for grandchildren, so far three pairs, plus a hat. I’ve also made a raglan sleeved sweater for my partner as the previous one had holes in the elbows. That is holes in the patch on the elbow which was itself knitted double so I reckon he’s worn through three elbows the last of which was felted. I’ve also finished a scarf/cowl handknitted from Colinette Tagliatelle in garter stitch with an elongated row every third one. And I’ve started a garter stitch blanket from Number Knitting, a 1952 book by Virginia Woods Bellamy which proposes a unit system of knitting with lots of great patterns and ideas. So the blanket is made up of squares formed by a double decrease in the centre which are then added to by picking up and casting on. It’s supposed to be the knitting that I can do in front of the tele but I haven’t settled into it enough for it to be that yet. And this is the cover of the book. I have had it years, bought in a second hand book shop when books of this vintage were commonplace, and not really done much with it apart from knit the little sample pieces she demonstrates but I think it’s full of potential. One of the most interesting things she writes about is the link between her method of knitting and American pieced quilts.